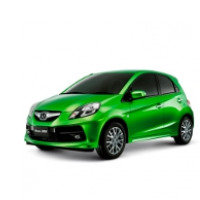 On Honda Brio :- Get Insurance under MISP at Re. 1 (worth upto Rs. 19,000) | Additional offers for selected Corporates for all models. (Kindly contact your nearest dealer for Models & Variants wise offers) On Model Year 2018. Equipment level is not so good. Lacks rear defogger and it has less boot space of 175 L only and has ordinary space for rear seat passengers. Audio system lacks CD player in it. The car gets bumpy and unsettled on uneven roads. The stylish car manufacturer Honda has introduced its new small car Brio which is a great attempt to match with the segment of Maruti Swift in India. The Brio is good at easy mobility, excellent visibility and convenient in tight cityscapes. Its petrol variant gets a 1.2 L, 4 cylinder, 16 vlaves i-VTEC engine offering maximum power of 86.8 BHP @ 6000 RPM in coupling with the maximum torque of 109 NM @ 4500 RPM. It has an enough interior space cabin with lot of headroom, shoulder room adding an airy feel to the cabin. Honda Brio is designed keeping in mind Indian requirements and engineers at Honda Company paid a lot of attention to the details in order to make it more comfortable and practical hatchback for the Indian market. Honda Brio is available in 12 variants. View below listing of variants based on their fuel type. Upcoming variants of Brio are also listed here. * Prices of Honda Brio car indicated here are ex-showroom price not the on road price of Brio. Price list is subject to change and for the latest Honda Brio India prices, submit your details at the booking form available at the top, so that our sales team will get back to you. Honda Brio mileage mentioned here is based on ARAI test drive and not from Brio review by vicky team. "The prime specs of Honda Brio are listed here. The overall length, width of the car should give you an idea about parking space it require. The ground clearance (lowest part of the car to the ground) will give you the measure of water wading capability and confidence of Brio's capability to run over potholes and speed breakers. However GC (ground clearance) won't tell everything. Other important factors like approach angle, breakover angle and departure angle is required to assess the cars' ability to run in rained indian roads and light off road tracks.Engine specs of Brio are also listed here. With the power (in bhp) and torque (Nm) figures the most important ratios - power to weight ratio of Brio and torque to weight ratio. The displacement (in cc) is the measure of cubic capacity of the engine. Earlier there was a notion, larger engines produce more power and torque however with the invention of advanced technologies this is no longer true." Find your favourite Honda Brio car features list. While power windows, power steering and central locking are considered prime convenience features, the presence of safety features such as abs and airbags will give the necessary safety for the Brio occupants. Alloy wheels is something everyone would love to boast about. Such a small car with less boot space and mileage that I got around 12kmpl in the city drive and 16kmpl on the highways with the ecolights on.But the company assures the claimed mileage of about 19.25kmpl.Other than mileage,riding dynamics is very good. I have got this car in March 2012. Right now it has run 4000 km. Everything is fine except the average. Though the company claims 18 avg per ltr, in City like delhi it comes out only 11 to 11.5 km per Ltr. Now I think, I should opt for Maruti Swift or Ritz. Interested to know on road price of honda brio. I have got Getz Prime 2008 done 39000km/interested to purchase in exchange.how much extra i will have to pay. whether easy finan ce will be avail,able,should give the dealers name an d address.